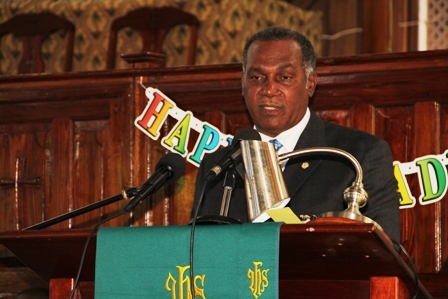 NIA CHARLESTOWN NEVIS (November 29, 2013) — Premier of Nevis and Minister of Education Hon. 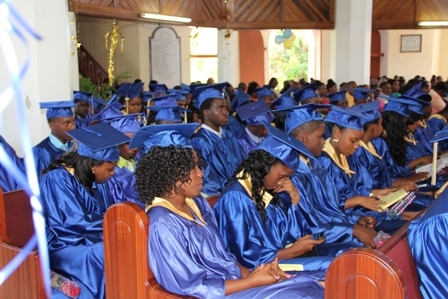 Vance Amory, reminded 66 students who graduated from the Gingerland Secondary School (GSS) on November 28, 2013, that moving forward they should always be mindful of the attitude of gratefulness. “I want as we look at the School’s accomplishments through collaboration and partnership, that you recognise that there is a quality, a very important quality, called gratitude. It is a quality that sometimes we do not exhibit very freely and gratitude means that you have to always remember the persons who helped you to be where you are; who helped you through difficult times; who gave you advice, who sometimes held your hand when you had a difficult situation through which you were going. “If you were able to develop and cultivate and always practise the habit of being grateful, that habit of gratitude you can make an even greater success of your lives. You are today at a crossroads. You…are coming along a journey and life is that journey which may never end there is maybe a break, maybe a little upheaval sometimes but this journey requires that each one of you recognises your place along that life journey,” he said. Let the attitude or attribute of being grateful: remembering your parents, remembering the sacrifices they’ve made, remembering your teachers remembering the hard hours they put in during the school’s vacation when they should have been rejuvenating and recharging their batteries. They were spending their energies on you to help you. I want you to remember that attitude of gratitude which is so fundamental to human success,” he said. Mr. Amory also told the students that it was his duty to seek to encourage them to make wise choices in their lives and in so doing, to listen to the wisdom of their parents and older persons. “They have been through the wars, they have been and passed where you have been and if you have questions or doubts about anyone then you can always look at someone who you believe you can have confidence in and ask that person to help you with the choices you make because the choices you make will determine the type of achievement which you will have down the road. “Life is not something that happens just so. It’s not a lotto and if it’s a lotto, very few people win the lotto. Life is what you make it and it is in your power, as young people, having been taught well at the Gingerland Secondary School to seek to make wise choices and one of those things which will help you in your life’s journey is hard work,” he said. The Education Minister further told the graduands that they should apply themselves with diligence, since diligence and perseverance were qualities they would need to help themselves. To those who planned to further their studies Mr. Amory urged then to first look to the needs of their country and see how they could best make a contribution to those needs. “What am saying here is look outside of yourself, look to how you can serve your country and not just look to what you would like because it is in serving others, that we get blessings and rewards. “I know it may sound archaic, it may sound religious but I want to assure you those archaic and religious things are fundamental to human behaviour, to human success,” he said.